The Epson Home Cinema 3700 home theater projector ($1,499) is the somewhat brighter near twin of the $1,299 Epson Home Cinema 3100, reviewed separately here. The $200 extra that you'll pay for the 3700 mostly buys 18% to 20% boost in lumen output and a pair of onboard stereo speakers. The Epson 3700 boasts a higher contrast ratio as well, but not enough to make any difference in real-world viewing, particularly if there is any ambient light in the room. The set of 10-watt stereo speakers may be quite handy if you don't have an external sound system. However, since the 3700 is not all that portable, we would expect most users to be placing it in a fixed installation with surround sound. In this case you won't need the speakers and the higher lumen output is the best argument for choosing the 3700 over the 3100. Picture quality for film and video, data and presentations, and even 3D is nearly identical for the 3700 and 3100 and is covered in more detail in the Epson 3100 review. Briefly, however, the 3700's color presets--Dynamic, Bright Cinema, Natural, and Cinema--all deliver solid video quality straight out of the box, with noticeably darker blacks and more saturated color than the entry level HD 1080p models like the Epson 2040 for just $799. For 3D, the 3700 offers two 3D color modes. One delivers higher brightness--though still lower brightness than any of the 2D modes--but it adds a slight green bias. With most lighting conditions, you'll probably prefer the extra brightness to the better color. The 3D supports Epson's $99 glasses and third-party Vesa RF models. For data and presentations, the 3700 delivers vibrant, bright color, and it handles detail well. White text on black was easily readable at 5 points in my tests. Black text on white was crisp even at 4.5 points. The Epson 3700 performs identically to the 3100 in many ways. We measured the same input lag and found the fan noise to be virtually identical. They both offer the same lamp life and warranty. One of the main differences is in the lumen output, with the 3700 being about 18% to 20% brighter than the 3100 in all color modes. Brightness. Using the widest angle setting for the zoom lens, the measured ANSI lumens for each of the preset color modes is as follows for High, Medium, and Eco power modes. Video Optimized Lumens. All four color modes deliver more than acceptable quality for video and film straight out of the box. However, Bright Cinema without any adjustments--our choice for Video Optimized setting--delivers more accurate color than Dynamic mode. It's bright enough for a 225" diagonal 16:9 image in a traditional home theater setting or a 140" image with moderate ambient light. Presentation Optimized Lumens. For data and graphics presentations, Dynamic mode offers eye-catching color at the 3700's top brightness. Its 3438 lumens is bright enough for a 170" diagonal 16:9 image to stand up to moderate ambient light. Zoom Lens Effect. Setting the lens at the full telephoto end of its range curtails a surprisingly low percentage of light for a 1.6x zoom. We measured it at 3152 lumens, which is only 8% less than with the wide angle setting. This is remarkable, for it is not unusual to find 1.6x zoom lenses that curtail light by as much as 25% at their telephoto end. Brightness uniformity. The brightness uniformity measurement is 86%--easily high enough to make differences impossible to see with any image that breaks up the field of view. Color Brightness. The 3700's three-chip LCD design guarantees that color brightness matches white brightness, so full color and white objects are in balance on the screen. The design also rules out any possibility of rainbow artifacts. Fan Noise. The 3700's fan noise in Eco mode is barely audible from as little as two feet away. Since light output in Eco mode is ample for most dark room home theater, this will be the preferred setting for many users. In other modes it's louder, but the steady air flow combined with a low-frequency hum can quickly fade from awareness as long as you're not sitting too close. In Medium lamp mode, the sound is audible but even at 8 or 10 feet, I wouldn't notice it unless I were listening for it. In High mode--which Epson rates at 35 dB--it's audible from 30 feet. If fan noise is a concern, you'll probably want to stay with Medium or Eco for home theater. High Altitude mode is recommended at 1500 meters (4921 feet) and above. With it on, Eco is a touch quieter than Medium without High Altitude mode, and Medium is a touch quieter than High without High Altitude mode. High mode also gets a little louder, but not by enough to make it any more bothersome than with High Altitude mode off. Input lag. The 3700 has a Fine and Fast mode. Oddly enough, they both measure 28 ms when other heavy-load video processing like Frame Interpolation is Off. Activating FI will increase input lag up to a maximum of 105 ms when it is set to High. Lamp life. Epson rates the lamp at 3500 hours in High mode, 4000 in Medium, and 5000 hours in Eco. Replacements are $299. Warranty. The price includes a two-year warranty for parts and labor and a 90-day warranty for the lamp. The 3700's 15.2 pounds makes it about a half-pound heavier than the 3100, but it's the same size. It also has the same 1.6x zoom and lens shift as well as the same +/- 30 degree vertical and horizontal keystone correction. All this makes the setup issues virtually identical to those covered in the Epson 3100 review. However, there is one big difference -- the 3700 has two built-in 10W stereo speakers, which the 3100 lacks. They are mounted on the rear panel, which means that if you want to use them, you must avoid placing the 3700 in a bookcase or shelf behind the seating area, which is an otherwise ideal placement for the 3100 and the 3700 both. The first three items here are the same as those noted in the 3100 review. Fan Noise. The fan noise with the lamp on HIgh is louder than normal for home theater projectors. Medium is much quieter, however, and Eco is nearly inaudible and much quieter than most home theater projectors at this price point or lower. Auto iris adjustment. When the brightness level changes between one scene and the next, there's occasionally a lag before the auto iris finds the right setting. If this becomes noticeable to the point that it bothers you, you can turn the auto iris off. 3D requires compromise. The two 3D modes give you a choice between better color fidelity or a brighter image. Speaker placement. 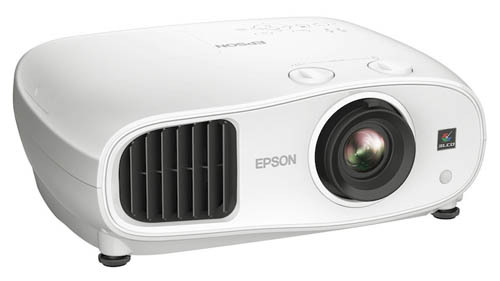 Although the audio quality on the Epson 3700 is better than many projectors offer, the placement of the stereo speakers on the back panel makes them most useful for rooms where the seating area is entirely behind the projector. It's nearly useless for setting up a projector behind the seating area, much less on a shelf in back, with the speakers almost touching a wall. 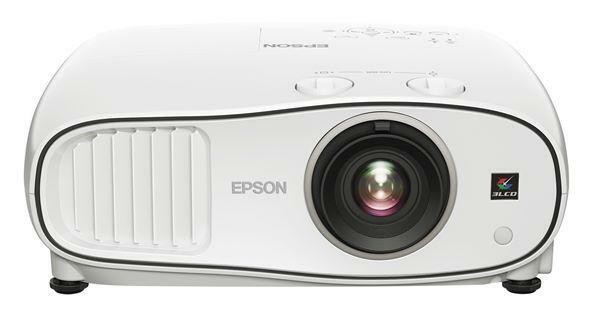 Compared with less expensive models like the Epson 2040, the Home Cinema 3700 offers a significant step up in contrast ratio, color vibrancy, and color fidelity; a longer 1.6x zoom lens instead of the 1.2x; and the addition of vertical and horizontal lens shift. It also delivers higher brightness and more features, including Epson's Super Resolution, Gamma settings, Picture-in-Picture, and a Panel Adjustment control to manually adjust color convergence. The keys to the value of both the Home Cinema 3700 and 3100 are exceptional brightness and installation versatility along with solid, sparkling image quality for the money. With only $200 between them, the decision between the two boils down to two questions: (1) Do you need the extra 18% to 20% light output that the 3700 delivers, and (2) do you need the onboard speakers? If the answer to either of these questions is Yes, the Epson 3700 is an excellent choice. Otherwise, the Epson 3100 delivers outstanding bang for the buck and it is highly recommended with this site's Editor's Choice Award. The Epson 3100 and 3700 are both selling for street prices somewhat under their official MSRPs. Visit the authorized Epson dealers below for current prices and availability. I just picked up an Epson 3700 at BB for $1100, very pleased with it so far, pretty much the same as the 3100, with a bit better brightness, contrast and onboard sound. I am on travel for work, so the onboard sound is definitely handy, love gaming and watching movies on this thing. Cant go wrong with either one of these projectors. Anyone have a wireless audio setup with this projector? I just bought one and am looking to see what that might entail. Bought this In may, best investment. Excellent with the movies, playing video games, just watching TV.